If you’re looking for a typical “westernized” style of massage… you may wish to look elsewhere — as there is nothing typical or westernized about the techniques used in Chinese Massage Therapy! Chinese Massage Therapy is not a century or two of evolving techniques… rather it is thousands of years of disciplined dedication to the practice of the unique skills and art of true Chinese Therapies… passed down—generation to generation. At Wendy’s… we invite you to escape for a Chinese Relaxation massage or choose one of our specialties… Tuī Ná, Caī Bei, Chinese Deep Tissue, Maternity, Hand and Foot, Post Operative, Combination or our Couples massage—and be sure to ask about our Stones and Cupping therapies. When we first introduced Tuī Ná (pronounced 2-e-naw)… no one had heard of it, and few were able to pronounce it... now it is our most popular and requested massage therapy—over 35,000 smiling customers have enjoyed its benefits and lovingly coined it the “Noodle” massage! 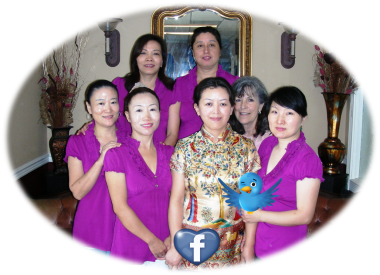 At Wendy's Massage, the cultural arts of 'Chinese Massage Therapy' are solely practiced and have been enjoyed year after year by our customers — more than 39,000 since 2010!